It’s difficult to get work done on a snow day when you don’t really have access to your usual tool kit. I’ve got a lot of projects in the works right now, but many of them require access to the school’s workshop — since everything is a prototype for something I’m building with students later, it makes sense to build it in the workshop where everyone else will build it. Among other things, that tells me what tools I need, and what I don’t currently have. But I do have some home projects brewing. 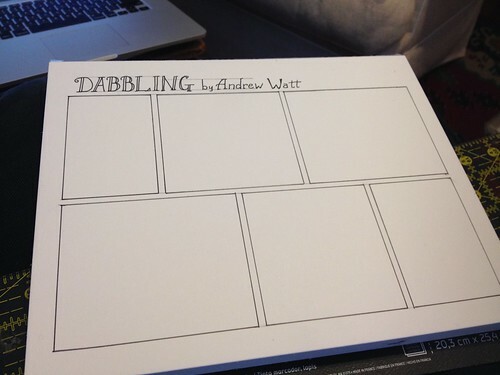 Of course, I hope you know about “Dabbling” — this cartoon I’ve recently launched — where a powerful magician explores a new art form to try to communicate secret teachings to the world. I’m not really sure where it’s going. But I do know, from first-hand experience, that if I don’t draw it… it doesn’t happen. So I’m using my snow day to start the next few issues of the series, by drawing the frameworks that will become the comic. Even this much is not as easy as it looks. I ruined one sheet of paper already making this much — and this is heavy paper, called “illustration artboard”. It’s telling that I could use the ruined sheet, cut in half and covered with other paper, as a cover board for a book. And that’s nice — having the sense that the ruined elements of one project can be used as the raw material for another project. That’s the way these things work — that the imperfect is nearly always suited to become the raw material for another perfection. Thomas Taylor, in the Orphic Hymns, says that to Saturn “perfection and decrease belong.” Meaning that the top of one game is usually the turning point into decline, and the start of a new game. But it’s also sheer lunacy to assume you can build a big new thing without scaffolding, without a plan, without a program. In teaching we call it “scope and sequence” — what do you want to kids to learn six weeks from now? six months from now? Six years from now? If that’s the overall goal, then the baby steps have to be started here, in this way. The present work sets future direction and overall habits of mind. And that’s the habit of mind that I’m trying to cultivate now. How long does it take, really, to produce an issue of Dabbling? Start to finish, how long does it take to conceive of a storyline, build the frame, pencil in the rough sketches, ink the line art, scan, and post the piece? Longer than I want, shorter than you’d think, more than most professional artists, I’m sure, for something of similar quality. Regardless, the work begins with a foundation, and a scaffold. And this is what I’ve built today. What have you built? How are you structuring your future success with the work you’re doing today?